U.S. Customs has made the PAPS program mandatory for anyone or any company importing commercial goods into the United States. 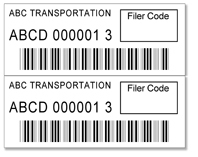 PAPS, while similar to the pre-arrival review system (PARS) that is used by Canadian Customs, is a separate program and barcode labels are NOT interchangable. The carrier affixes a label to each commercial invoice and the ACE manifest. Place one barcode on the commercial invoice(s) for the shipment to be cleared. Place the second (matching) barcode on your ACE Mainifest. Enter the Filer Code for the Customs Broker that will be clearing the goods. The carrier then faxes the barcoded invoice(s) to the appropriate Customs Broker who the prepares and files the release with U.S. Customs. A phone number and a contact name in case of a problem with the fax and/or shipment. Fax the commercial invoice and a copy of all other documents received from the shipper. The more time you give the broker the better. Most brokers require 1 to 2 hours to process shipment once the fax is received. When processing is complete, the data will be sent electronically to U.S. Customs. The Carrier then proceeds to the border with the bar-coded invoice(s) and manifest. Upon arrival at the primary line: Hand all your documentation to the U.S. Customs officer. Your CF7533 manifest should be on top. The commercial invoice(s) should be next, placed in the order they appear on the manifest. The Customs inspector scans the bar-code, retrieves the release information already entered by the Customs Broker. The entry is given a "CLEARED" or "INSPECT" tag. If "CLEARED" the shipment is released and the driver can proceed into the United States. If not, the driver can be directed for further inspection or processing. National Motor Freight Traffic Association, Inc. There is a $70.00(US) fee for the code which must be renewed annually when applying by mail or fax. This process can take 1 to 2 days. You may also apply for and renew the SCAC code online at here. When you receive the letter assigning you an SCAC, please read it carfully for further instructions. Name of the company who holds the SCAC code. The numeric number of the label. The barcode of the SCAC code and number combined. How many label per set will I need? How do the labels come? The labels are printed on a roll and perforated into sets for easy set separation and distribution. The labels are 2.5" wide x 1" tall white pressure sensitive labels with the information printed in black. The labels are printed and in 24 to 36 hours after your order is received. This is the information that will be printed on the labels. Please be sure to double check this information carefully! All orders will be confirmed by phone, fax or email. Complete the form below, or download pdf order form.